A woman's polonaise of cream-coloured silk. The polonaise is made of two shaped front and two shaped back pieces without a waistseam. inverted pleats in the centre back seam, two seams either side of it and the two side back seams create fullness at the back. It is open at the front, meeting at the centre front at the very top and curving away towards the back. 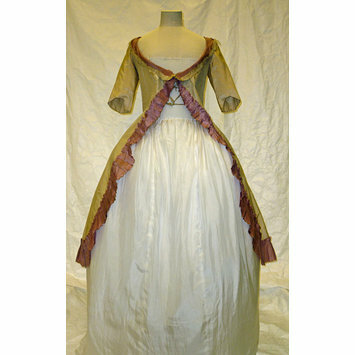 The bodice and elbow-length sleeves are lined with bleached linen. The bodice lining has 3 pair of linen tape ties for fastening. The neckline is wide and curved, with a shaped collar of lilac silk, edged with a pinked ruching of the cream silk. A wide band of the lilac silk, pinked and gathered edges the hem and polonaise fronts. There are two loops (one now missing) of lilac silk gimp at the waist either side of the centre back on the inside, corresponding to two silk-covered buttons on the outside, for looping up the skirts. The three seams at the back are covered with lilac silk gimp, ending in three tassels of the gimp. Stitch marks on the sleeves indicate that it probably had sleeve cuffs. 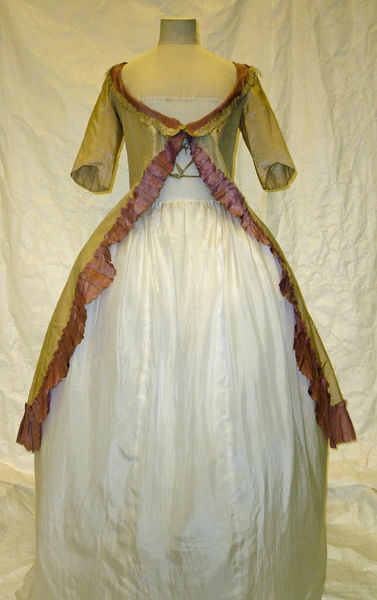 There would have been a 'false front' to cover the gap at the front, and possibly a matching petticoat. The polonaise was altered for fancy dress in the late 19th century. Large darts (since unpicked) were sewn in the bodice fronts and the collar at the front edges unpicked, probably to adjust for size and a Victorian corset.